We developed a revised photocyclization method for preparation of [n]helicenes and their derivatives on a multigram scale. Using the concept described above we are focusing on a large scale preparation of various helicene derivatives or heterohelicenes. Combining the electron rich and electron deficient starting materials we are interested in a CT-complexes formation. 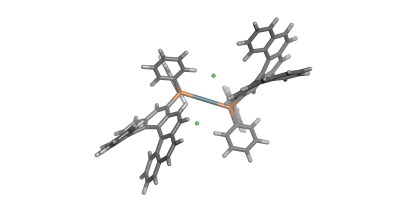 The chirality of non-racemic helicenes can be employed in construction of chirally endowed materials such as HPLC stationary phases or membranes. Conductive organic polymers can be used in two main electronics applications – materials used to construct various devices e.g. PLED (polymer light emitting diodes, part of OLED, organic light emitting diodes), OSC (organic solar cells), OTFT (organic thin film transistors) and as selective layers in chemical sensors. Thin films made by polymeric semiconductors or by particular molecules embody excellent electron mobility and they serve as fundamental structural elements of printed electronics or hybrid inorganic-organic devices. In contrast to common inorganic components based on silicon the energy expenditure of OTFT fabrication is very low and the technology allows the use of common printing techniques. Our goal is to prepare conjugated thiophene-based and polyacetylene-based polymer systems containing helicene substituents which would exhibit promising electrical and optical properties. All conjugated polymers contain π-electrons which are highly delocalized and easily polarizable. These features play important roles in the electrical and optical properties of polyconjugated systems, making them rather different from conventional conductors. Helicenes are very promising compounds in enantioselective catalysis, due to their chirality and considerable steric hindrance. Attachment of helicene moiety to the structure of flavins leads to new helically chiral flavins, which are not only suitable for various organocatalytic redox reactions, but their unique properties allows for their use in photocatalysis as well. Coordination chemistry of helicenes and their use as chirality inductors is still strongly under-developed. Among privileged lignads exhibiting central, axial or planar chirality, use of helically chiral ligands in transition metal catalysis is still very rare. We are focusing on helical phosphines and their transition-metal complexes potentially usable in homogeneous asymmetric catalysis.